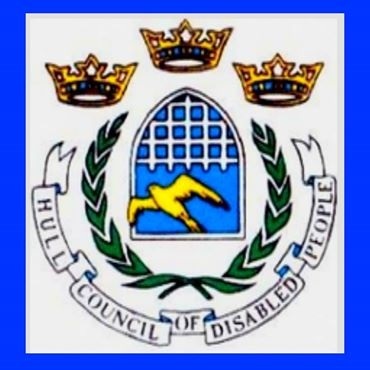 Hull Council for Disabled People is a local charity offering various services to the challenged, and offers an information service on welfare rights, benefits advice and information alongside help filling in forms and with advocacy, a free confidential service. It also has a drop-in centre and cafe, wheelchair hire etc. The Daggards are pleased to support this cause. At championship level, Irish dancing becomes a very expensive hobby, and to support two young East Hull sisters who have World Championship qualifications the Daggards have agreed to join various Lodges in putting towards funding for the youngsters, who are not only very talented but extremely dedicated. 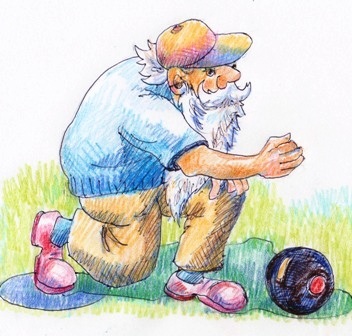 Wolfreton Park Bowling Club (for members 65 - 94) offers social bowling at home and away, giving local older people the opportunity to socialise and improve their health with outdoor exercise. 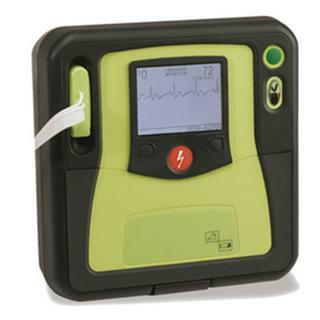 While this is a self-funding enterprise, the WPBC has been advised to purchase a defibrillator, and the Daggards are happy to join with Thesaurus Lodge 3891 in contributing towards this worthy cause. Ocean Youth Trust is a small charity which inspires young people to rise above personal or domestic difficulties and change their lives, enjoying themselves through Adventure under Sail. A number of deaf children from Hull and nearby are setting sail this month and the Daggards are pleased to contribute towards this admirable exercise, thereby supporting the Institute for the Deaf as well as Ocean Youth Trust. We wish them Bon Voyage! calendar of inclusive and accessible social activities for disabled people of all ages and abilities. The Foundation supports over eight hundred families affected by disability in the region, and the premises in central Hull include a therapy room, a training suite and a large informal room for support groups and advice sessions. The Daggards are delighted to support this worthy enterprise; one of our number visited and was well impressed by the friendly atmosphere, the delightfully clean and organised rooms and the helpful, caring staff. The expenses involved in training young athletes are tremendous and the Daggards have joined with Kingston Lodge 1010 in contributing towards the training of a sixteen-year-old Hull boy who is one of the the top ten swimmers in the country, as increasing demands are made on his family. We wish him every success! As Christmas approaches, the Daggards have looked to the vulnerable in need of help, and have been pleased to support the Newbridges Inpatient Mental Health Unit, an eighteen bedded Treatment Facility for men with significant mental health crises. The donation will go towards the purchase of equipment that will assist with providing health and well-being through exercise and occupation, in addition to more traditional pharmaceutical treatments, reducing the risk of relapse and promoting sustained recovery. The Daggards are pleased to contribute to the musical development of a talented youngster who himself has supported local enterprises with his performing skills. As nowadays the difficulties encountered in opportunities for advanced development with increasing expenses and stringent time demands, the promotion of such skills is to be encouraged. Catzero, already doing sterling work in Hull, has extended its influence over the Humber to Grimsby, where it works in partnership with Child Protection, targeting whole families and assisting them to resolve issues. In October this year Catzero is running a holiday programme (following the success of the Full Families Activity Programme during the summer holiday) and the Daggards are pleased to be able to offer support in this worthy enterprise. A new Lodge, Phoenix 9633 is beginning in Hull in October; plans are under way for the consecration, after which the Phoenix Brethren will meet in the Sailmakers Arms in Hull Old Town, reviving the ancient tradition of meeting in a tavern. The Daggards are delighted to support this forward-looking initiative. The Daggards are happy to support The House of Light; a not-for-profit local charity offering help, advice and information for women and their families who are affected by antenatal and postnatal depression. The services are provided by qualified counsellors, some of whom have had personal experience of mental health issues. 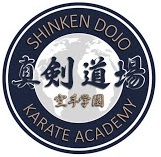 Brough Lodge 5464 is supporting the Shinken Dojo Karate Academy in East Hull which offers Wadu Ryu karate classes for children and adults.The local club, which has been based at Westcott Street Primary School for over three decades is in desparate need of new mats and safety equipment, and the Daggards are pleased to join with the Brough Lodge in contributing towards this enterprise. 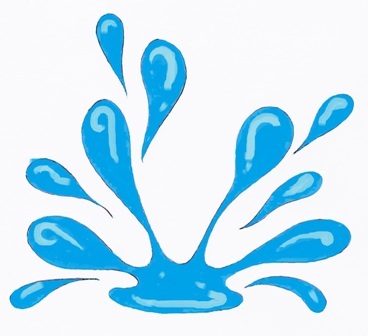 The Daggards are delighted to support Brother Darren Lowe, Junior Warden of the Ridings Tablers' Lodge 9586 in contributing towards the development of the Frederick Holmes hydrotherapy unit, an essential specialist provision made available to all pupils and students in late May. The special school caters for pupils with physical disabilities, many of whom also have learning difficulties as well. The hydrotherapy pool enables the participants with restricted movement and muscular weakness to benefit through increasing mobility and strength, and other disability problems are alleviated. 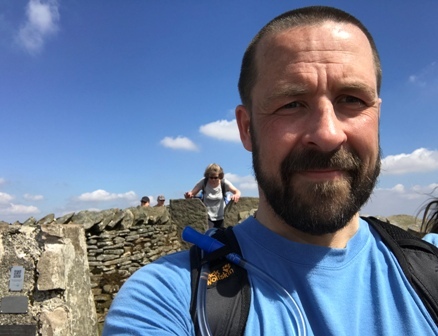 Rob Atkinson, Senior Warden in the Technical Lodge 5666 and a member of the Daggards team, took part in the Yorkshire Three Peaks Walk in early May in aid of the Masonic Samaritan Fund and Festival 2018 and we are delighted to support him in this very commendable exercise. It comprised a twenty-five mile circular walk round Yorkshire's finest countryside. Fortunately, the weather was not unfriendly. "It was a real challenge," Rob confessed, "but we managed to scrape home in 11.5 hours." Well done, Rob, and all the other participants! "Thank you," was the heartfelt message from the Special Care Baby Unit at Scarborough Hospital, "for your wonderful donation of the coffee table, lamps, mini fridges, cups and very useful items." The Daggards are pleased to have assisted in this enterprise (and proud of Mike Noble, who went to considerable trouble to supply the necessary goods.) "These items." Mike remarked, "were to enable the SCBU staff to transform a room in the ward into a comfortable 'half-way house' for the new parents to take care of their babies - somewhere that felt a little more like home while the babies were still under treatment and observation." 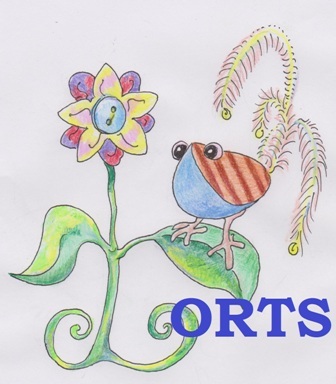 Orts is a sewing collective run by local women who together have designed and produced articles of clothing and items for sale such as fabric flowers and decorative birds, created out of orts (a late Middle English word meaning "scraps".) The collective is working on a project producing a safe haven for abused and vulnerable women in Hull, many of whom don't have English as a first language. Not only does the haven provide a useful retreat; it helps promote self esteem, basic household and social skills. The enterprise is proving highly succesful and the Daggards are pleased to support the ladies. St Andrew's Hospice, Grimsby performs sterling work providing comprehensive free care for people of all ages with progressive life-threatening/limiting illnesses, and the Daggards were pleased to be able to present a cheque at the Hull charity shop on Newland Avenue towards this very worthy organisation. Two particular enterprises aimed at assisting young people are currently requiring funds; music sound equipment for the children's bedrooms to help those with sleeping difficulties, and updated console equipment for the adolescent unit. We are delighted to assist with these. The Daggards have made their first contribution of 2018 to the Hull and East Yorkshire Centre for the Deaf; a worthy organisation constantly striving for self-improvement. We are happy to observe that the facilities within the Spring Bank premises are increasing and improving, and that the many folk that attend on a regular basis (for bingo, snooker, dominoes league, parties at Christmas, New Year's Eve, Valentine's Day etc. and of course the fund-raising Visual Choir) enjoy the benefits of this caring institution. The Daggards extend their sincere thanks to all those who kindly gave donations in lieu of sending Christmas cards this year! Your generosity is much appreciated, gratefully received and will be properly applied! 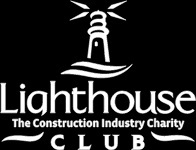 While the Lighthouse Club is a national charitable organisation, the Daggards are pleased to support the Lincolnshire and Humberside Branch, which provides a 24X7 helpline to deliver emergency support for those within the construction industry, or their dependants, in times of crisis, accident or bereavement etc. 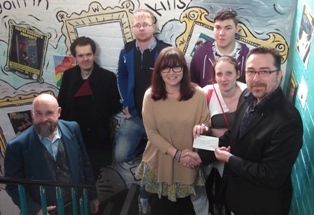 The Daggards are glad to support the HHCP (Hull Homeless Community Project) which is striving to make a positive difference to lives impacted by homelessness, both individually and at community level, dealing with mental health problems relating to homelessness and exclusion in addition to other social issues. 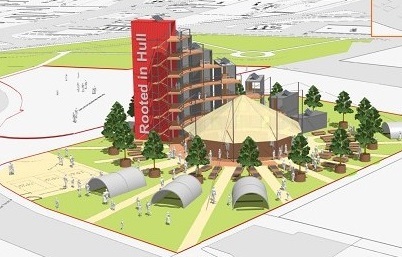 Rooted in Hull is an innovative Urban Agricultural Project on St Peter's Street in the centre of Hull, transforming a derilict site into community space and micro-enterprise hub based around food, farming and the environment and supporting the needy, who in the chilly approach to Christmas are particularly in need of help, and the Daggards are pleased to be able to support the work. Hull Street Angels perform sterling work helping the night life community of Princes Avenue, Hull, and are currently restocking equipment for what is anticipated to be a severe winter; assisting the homeless and unfriended with jackets, leggings and thermal clothing in addition to providing much needed food. 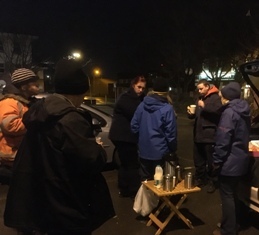 While necessary training is provided by the police for the volunteers, who give up their time in the dark evenings until the small hours, any funding for the food and equipment they donate to the needy is very welcome, and the Daggards are delighted to be able to contribute. 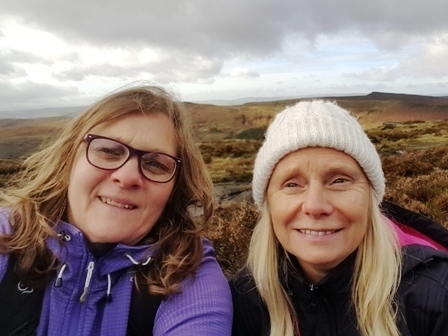 Congratulations to Judith and Jaqueline, Duke of Edinburgh Leaders, who undertook and completed a ten mile walk in and around the Peak District to raise funds for an initiative providing facilities and opportunities for disadvantaged children who would otherwise be precluded from enjoying important educational benefits. Items such as tents, back-packs, cooking equipment etc. are needed. Though the weather was poor at the start, Judith and Jaqueline persisted and the sun broke through as they reached the top of a tor. 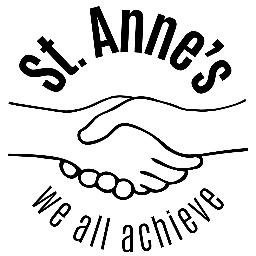 The scheme has been organised through St Mary's College in Hull. The Daggards are pleased to support them. As Hull has a number of families with seafaring connections with children in need, the Daggards are pleased to contribute to their welfare through the Sailors' Children's Society: details can be found on their website. As the weather deteriorates in the move towards winter, we are increasingly aware of those less fortunate than ourselves. The Provincial Coast to Coast Cycle Ride Challenge celebrating the bicentenary of the Province was well supported. 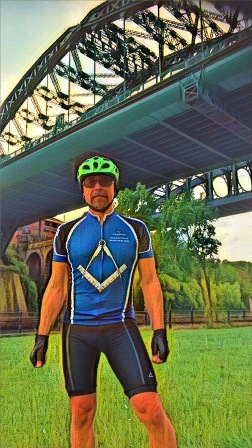 The ride started at Workington on the 1st September and finished at Roker Seafront on September 3rd. Amongst the forty-nine keen and energetic Freemasons undergoing this worthy enterprise were a number of Daggards: Richard Smedley, Jimmy Kerr, David Terry and John Wheeldon (pictured.) 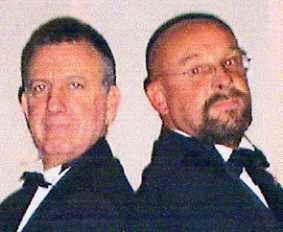 Their endeavours have enabled contributions to be made to various local charities including: Hull and East Yorkshire Centre for the Deaf, St. Anne's Special School (Welton), Yorkshire Coast Sight Support, Prostate Cancer Department at James Cook Hospital, Ryedale Special Families, Ova the Rainbow (Ovarian and Gynaecology Cancer Unit), and Bloodwise (Beating Blood Cancer). The less mobile Daggards have been keen to support their lycra-clad colleagues, of course, and are delighted to contribute to their fund raising. 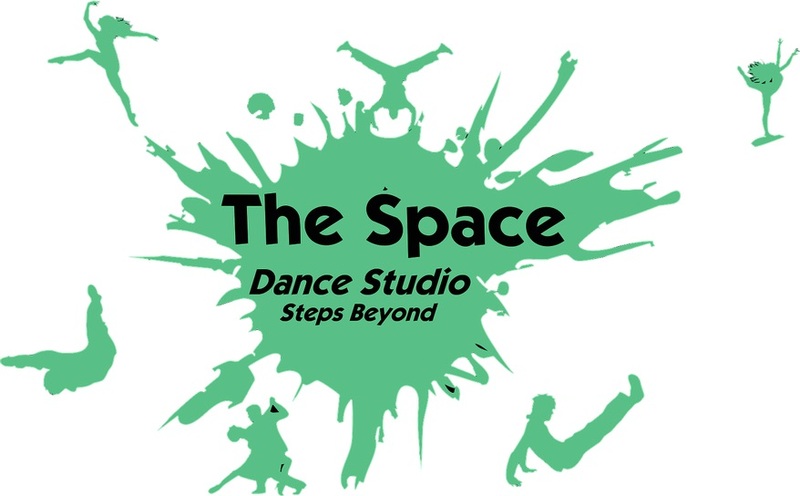 The Space Dance Studio on Grafton Street, Hull, is working extremely hard to promote life skills to young people in the city through dance and theatre. The classes are for all ages and offer opportunities for groups to travel to demonstrate their ability and to have a good time. The enterprise accomodates young people of all ethnicities, backgrounds and cultures as well as offering classes in other forms of dance for older people - their oldest student is ninety-two, their youngest, two years old. 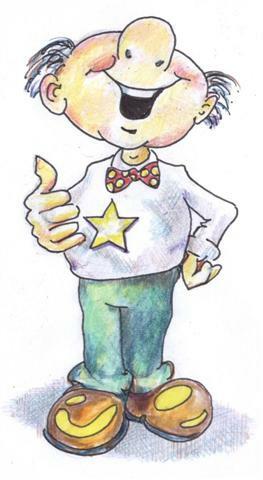 The Daggards are delighted to support the Space Dance Studio which is endeavouring to raise money to subsidise a number of 7 - 16 year olds to perform at DisneyWorld, Florida, and admire the achievement of the team who have achieved incredible success with youngsters, improving self esteem, co-ordination and communication. 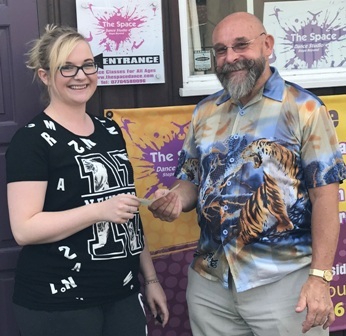 Samantha Rogerson, Dance Director, is here shown receiving a Daggards cheque from Eddie Wildman. Photograph by one of The Space music students. 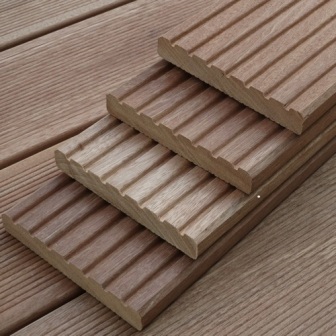 The Daggards are pleased to contribute to replacement decking for a family in the Hull area: the mother, who lost her husband to a heart attack ten years ago, has single-handedly brought up her two children, one of whom has spina bifida and is paralysed from the waist down. The garden decking is rotten, and it would be of enormous benefit to the family to be able to use the garden safely. The Daggards are delighted to join the Thesaurus Lodge 3891 and other contributors in making this possible. The 5 Senses Expressive Arts and Education Centre for Vulnerable Adults is a unique charity providing tailor-made support for students living in the Hull and Yorkshire Districts who have mild to severe learning difficulties, autism spectrum disorders, profound physical disabilities and other complex needs. 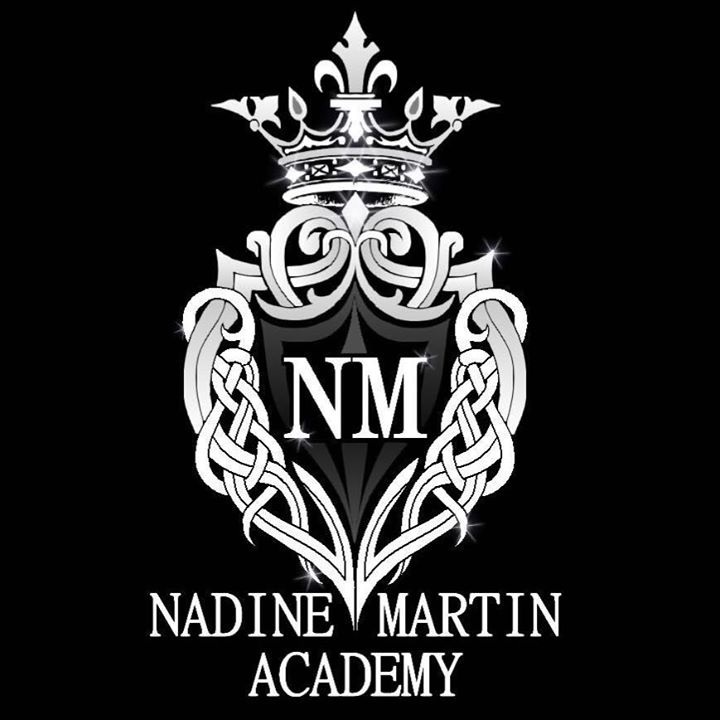 Through sessions including activities such as performance, cooking and sports studies, and external activities encouraging community integration, mobility and fitness with the support of dedicated staff, the students are encouraged to develop self-esteem, confidence and independence. The Daggards are proud to support them. Ionians U16s are due to tour Northern Ireland in October 2017 playing two games while over there. The picture above is of the boys celebrating after making it through to the final of one of the Yorkshire Cup competitions. Not all the young players have the necessary funds for this trip, and it is hoped the Daggards contribution will go some way towards assisting all the youngsters to go there. The Daggards wish them well! Once again the Daggards are pleased to contribute to the Hull and East Yorkshire Centre for the Deaf to enable the purchase of essential equipment for the Hull Visual Choir. The Centre's principal objectives are the provision of social amenities, recreational and educational facilities for the deaf and hard of hearing. 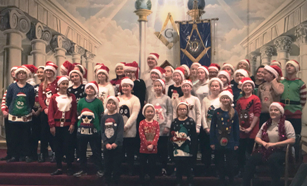 Over forty children belonging to East Hull Urban Arts performed Christmas music following the December meeting at the Technical Lodge 5666: now an annual event. Brethren and visitors alike look forward to seeing the enthusiasm of the youngsters who work hard in producing shows and musical events, and the Daggards are delighted to be able to join with the Technical Lodge in supporting this very worthy cause. Photograph by W Bro John Chapman. Ganton Special School in Hull has recently had some of its equipment vandalised, including a swing designed to take wheelchairs. Whether the school gets a new machine, or is constrained to repair the original, the Daggards are keen to contribute to this cause. The swing will be moved to a more secure area, now within the building. Beverley and District Talking Newspapers provides an invaluable service to those with impaired vision, sending them local news and a locally compiled audio magazine. The information is read and recorded by volunteers onto CDs which are then distributed. The Daggards are pleased to contribute to their funding. 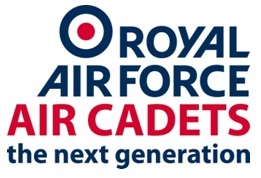 As Christmas approaches the Daggards are pleased to contribute towards a Christmas Dinner for the forty cadets of 872 (Hull West) Squadron of the air training corps. The cadets are studying aviation, D of E, flying and gliding, and are completing BTecs in many subjects. While the cadets have been examples of hard work, dedication and commitment throughout the year; not all have been able to attend the Christmas Dinner in recent times through lack of funds and, in some cases, financial hardship, and we are delighted to be able to assist. This Rugby Club, recently relocated to the James Reckitt playing fields (saved by covenant for sport and recreation for the people of East Hull) has a number of teams, including the Meerkats (children from three to six years old,) under 7s, right through to the under 15s in addition to an open age team. 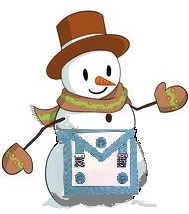 They need several essential items (including a boiler) and the Daggards are pleased to join the Technical Lodge 5666 in supporting the Lambwath Lions! 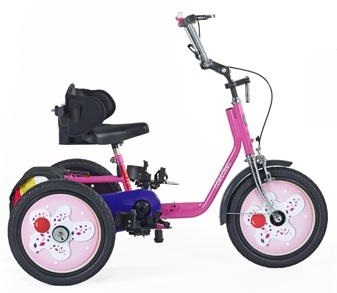 We are pleased to have joined the Humber Lodge 57 in contributing towards a specialist piece of equipment recommended by a senior pediatric physiotherapist for a local three year old whose development has been delayed by genetic disorders, and are delighted to hear that she is thrilled with her special trike and making excellent progress! 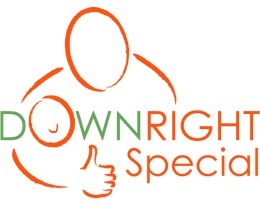 Downright Special is a local charity supporting children with Down syndrome in Hull and the East Riding of Yorkshire, assisting families and professionals in all aspects of the care and education of children with the condition. 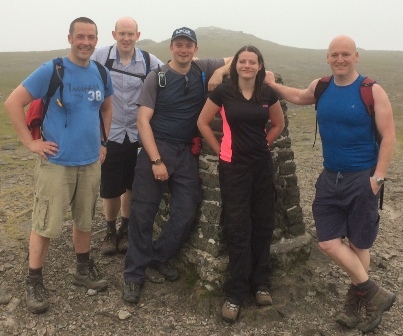 Brothers Eddie Brooks and Matt Owen of the Lodge of St Andrew 4683 ran the Yorkshire Three Peaks Challenge on 22nd May in support of this very worthy charity and the Daggards are delighted to make a contribution alongside the Masonic Lodges to this worthy enterprise. Well done, Eddie and Matt! Brother Jeff Adamson of the De la Pole Lodge 1605 limbered up with other cyclists to join in the East Riding Public Health Cycle4Life Challenge raising funds for the Ken Mullaney Oncology Charity - Ward 32 in Castle Hill Hospital, and the Daggards were delighted to assist in this admirable cause. Jeff cycled coast to coast across Ireland, followed by coast to coast across England from 23rd to 30th May 2016 Well done! Butterflies Memory Loss Support Group is a worthy cause and is very effective and proactive locally. Brother Robert Atkinson, Junior Deacon of Technical Lodge 5666, is a keen supporter of this charitable organisation, and the Daggards, along with the Brethren of the Technical Lodge, are proud to support him in his endeavours. While the Daggards support local charities, we also support local charitable enterprises and to this end are pleased to add to the contributions of others to worthwhile works. One such is Reuben Kelly, a university student who is visiting the isolated settlement of Helambu in Nepal with others to help children left homeless and orphaned by the earthquake last year, which killed over nine thousand people and injured more than twice that number. Reuben aims to rebuild a school and a girls' hostel, creating a safe environment which will promote learning. 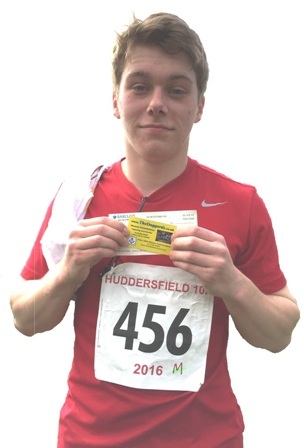 Reuben is putting together a local raffle and has just completed the Huddersfield 10k in 54.36 minutes as part of his fund raising enterprise. We wish him every success. 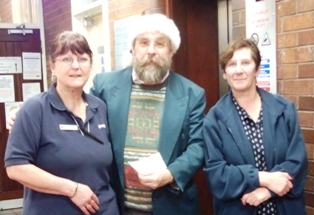 The Daggards are again pleased to be able to pass monies earned through their endeavours to worthy charitable causes, and a cheque was given to some of the Salvation Army staff in William Booth House, in Hull town centre. While we were thanked very nicely by the Salvation Army, credit must go to all those who have supported the Daggards presentations, and as Daggards, we extend our thanks to all our contributors. As Christmas approaches and the weather deteriorates we are more keenly aware of the many homeless people in Hull, and those who struggle to manage to keep body and soul together. Mr Tim Wilson is part of a group of around twenty volunteers who every Tuesday and Thursday night support rough sleepers and those struggling with everyday life, providing simple meals on a regular basis in addition to liaising with hostels and other organisations. 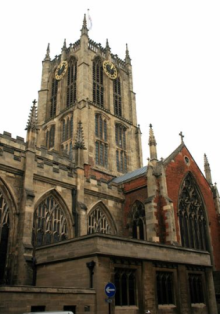 The group has operated for five years under the governance of Holy Trinity Church in the centre of Hull, and the Daggards are pleased to be able to use some of your contributions towards this very worthy cause. Thank you all for your help. It is with pleasure that the Daggards have joined with the Minerva Lodge in contributing towards the musical development of the Humberside and South Yorkshire Army Cadet Force Band, which is keen to increase and update its stock of musical instruments. 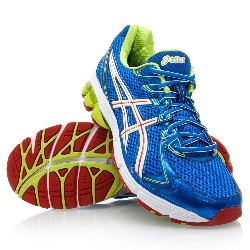 The Ellie Penrose Fund (soon to become a registered charity) supplies support for young people of 21 and under who wish to participate in sport, but lack the finances to do so - it may simply be a running top or trainers, but it is intended to give assistance and encouragement to those that need it. Ellie Penrose was a brilliant participant in many sports, and had just received an unconditional offer to study mathematics at University when meningitis took her life. The Daggards are pleased to give this Fund their support. The Daggards have been pleased to contribute towards a respite care holiday for a young family with their seriously ill mother: as one of our members remarked, every little helps, and we trust that the people concerned will benefit by a much needed break in the near future. 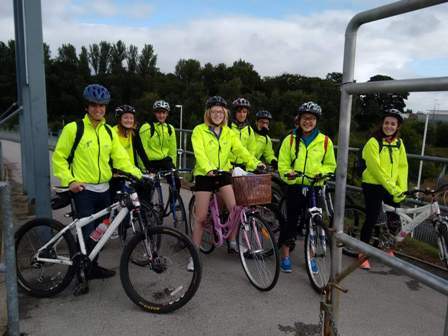 The St Andrews Hospice in Grimsby has been well supported by teenagers Nicholas and Alexander Smedley (wearing wristwatches) in a three week enterprise culminating in a sponsored bike ride from Hull to Hornsea. The Daggards are proud to contribute with them to this worthy cause, which is part of the National Citizenship Scheme. Well done, lads! The Daggards have been pleased to have joined with the Technical Lodge 5666 in supporting Bro James Steele, (centre) who succesfully completed the gruelling Three Yorkshire Peaks Challenge to raise funds for the Hull Samaritans. Well done James! We're delighted you've exceeded your target for this worthy cause! The Daggards are delighted to make a donation to Connaught Court: close to York City Centre, this purpose-built carehome looks after residents with nursing, dementia and Alzheimer needs. 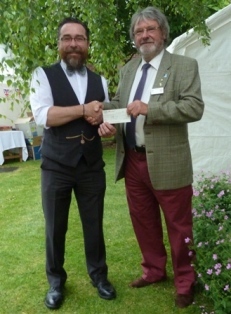 Pictured is W Bro John Wheeldon (Lodge of St Michael 7833) at the annual Connaught Court Garden Party where he had set up a stall to raise money for the event. 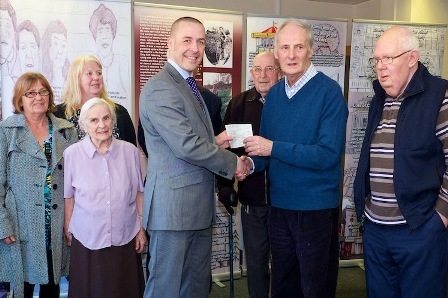 John (in the bow tie) is presenting the Daggards cheque to John Hoynes, Chairman of the Friends of Connaught Court. Many thanks to John and all other Masons who help the Daggards to help others! Worshipful Brother David Terry of the Humber Lodge 57 is pictured with the new manager, treasurer, immediate past manager and vice chairman of the Hull and East Yorkshire Centre for the Deaf. 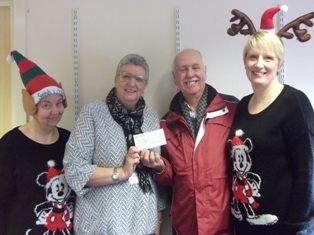 David is handing over a Daggards donation: as a valued member of the Daggards himself (as well as being Chairman of the Hull and East Yorkshire Centre for the Deaf) he is particularly pleased to be able to contribute to this very worthy cause. The Daggards are pleased to have supported one of the runners in the Hull 10k race. 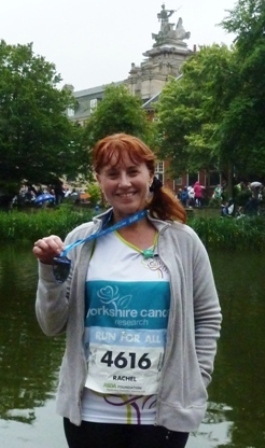 Rachel raised a sum far in excess of her expectations for Yorkshire Cancer Research. Rachel has been very supportive of the Lodge of St Michael 7833 in the past and it is to be able to reciprocate on this occasion, particularly as a number of the Daggards are connected with this Lodge. Congratulations to Rachel for her sterling efforts! Kingston Amateur Boxing Club is promoting excellence in the noble art for young people keen to develop their skills in this Olympic sport, and the Daggards, along with the Humber and Minerva Lodges, are delighted to support them in their trip to Ireland in early July. We wish them every success! Pictured is organiser and former boxer Steve Pollard, receiving cheques from Richard Smedley, Daggard vocalist and member of the Humber Lodge 57. 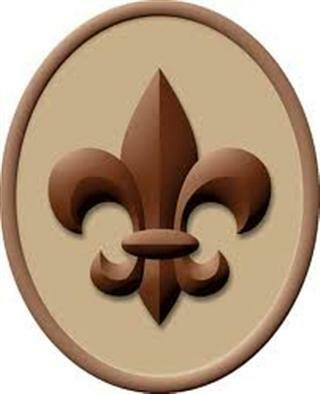 The Hessle Scout Group is the biggest group in the district, currently supporting 149 young people age six to eighteen in scouting activities, with the aid of thirty dedicated volunteer leaders. The Daggards are pleased to support this thriving enterprise, along with the Brethren of the Technical Lodge 5666 in raising money to replace the antiquated heating system at the Scout Den. The Daggards are delighted to have joined forces with the Beverlonian Lodge 9084 in donating towards an Under 14 Football Team -the AFC Kingston Cheetahs play Sunday League with an enthusiastic team who themselves support various charities and deserving causes. When the Beverlonian members heard what the children were doing to help others in addition to striving towards sporting excellence, the Brethren were quick to offer financial aid, and the Daggards amongst them instantly elected to double the donation. A Daggards cheque was handed to Mrs Pam Davies, Chief Executive Officer of Age UK Hull by Daggard W Bro Trevor Whitfield, the previous CEO. "We are proud to be helping elderly people in the city," he said, smiling at the two Christmas Elves who posed for the photograph. 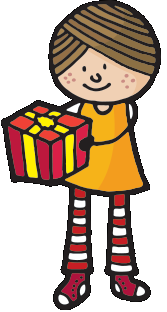 Christmas contributions for 2014 have included the Foodbank at King Edward St., Hull, The William Booth House Salvation Army in Hull and the St Andrews Children's Hospice in Grimsby. 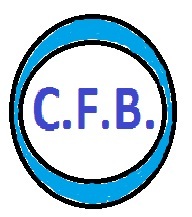 The Cottingham Food Bank is a recent but worthy enterprise supplying aid and advice to the needy in the largest village in England, and the Daggards are pleased to have directed some of their earnings (your contributions) to assist in this venture. 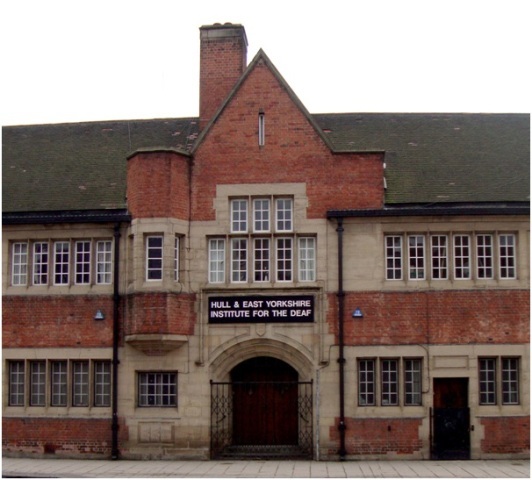 The Warren Project has operated in the City of Hull for over thirty years, offering a range of activities and services free to vulnerable young people of Hull, equipping them with increasing confidence and skills in a safe and welcoming environment. Committed to supporting young people, and against all forms of discrimination, the project maximises their involvement in a wide range of activities. 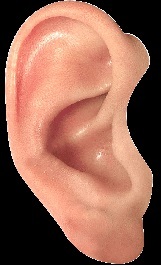 It also addresses a number of health and learning issues and offers confidential help when needed. It is currently under threat in today's stringent economic climate and the Daggards are delighted to offer their support. Here John Wheeldon (right) is presenting a cheque towards this admirable organisation. The Hull Churches Home From Hospital Service supplies much needed support and practical help to adults and children coming home from hospital. 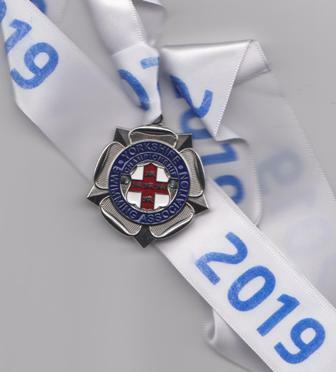 The volunteers are trained in a wide range of issues enabling them to provide assistance ranging from first aid to shopping, and the Daggards are pleased to support the volunteer training in this increasingly essential local charity. 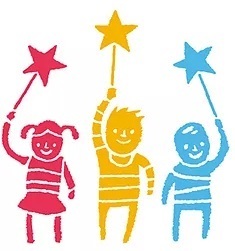 A contribution has been made to the charity "When You Wish Upon A Star" as there is a local "It's a Knockout" enterprise at the Brigg Football Club to support this. It is aimed at providing terminally ill children with some life enhancing event they would not otherwise be able to enjoy. 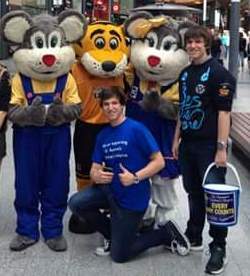 A note from one of the contestants said "With your help our team raised over £1000 and had heaps of fun in the process. Once again, THANKS." 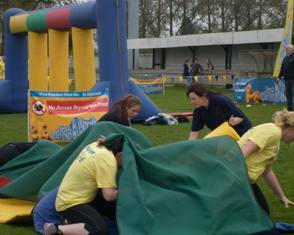 Pictured below are some of the team making their way through the obstacle course. 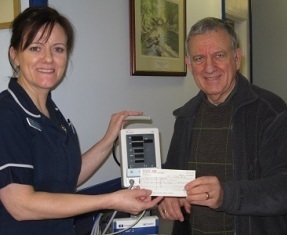 The Daggards have also contributed towards a much needed portable vital systems monitoring unit at Ward 10 in Castle Hill Hospital: here W. Bro Terry Lynn is passing a cheque to Sister Sandra Holdstock, a PVSMU between them. While the Daggards do not generally support individuals, on occasion they have done so. Last year they have been pleased to join with the Knights Templar within the Province of Yorkshire North and East Ridings in making a donation towards the scholarship of an eighteen year old violinist who has achieved high distinction in the ATCL diploma and been awarded a scholarship at the Royal College in Manchester. 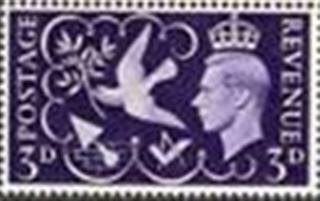 We were pleased to receive recent news from the soloist saying that her performing skills were better than ever and that she would be delighted to appear at any forthcoming functions as a token of gratitude. The terrible winter conditions of January 2013 persuaded us to direct some funding towards the Scarborough and Ryedale Mountain Rescue Team: their sterling efforts "to relieve sufferings and distress amongst persons affected by accidents or natural hazards on the North York Moors, or any other place if requested" are well appreciated. 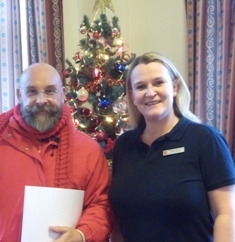 Another worthy organisation is the local Homestart Charity scheme: the Daggards have been delighted to donate towards the children's Christmas party in 2012. 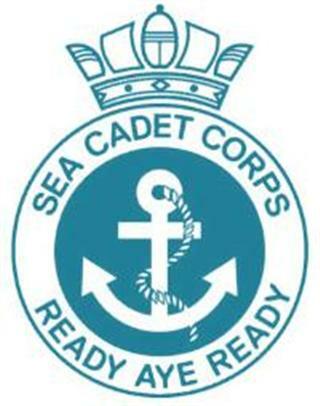 The Daggards are pleased to support the Hull Sea Cadets. A team of smartly efficient cadets helped with the serving on at a recent Knight Templar banquet (see Recent Performances page) and were well appreciated. The cadets are keen to promote their cause by assisting at functions. 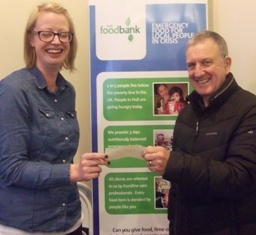 Your contributions have also assisted Hull Foodbank, which provides supplies for local people in crisis, and in providing a projector (with the Ridings Tablers' Lodge) for the Hull and East Riding Alzheimers Society to use in their carers information and support programme and in their volunteer events. The Daggards were proud to begin 2012 by supporting Wendy Lynn who is running in the LondonMarathon on behalf of the British Lung Foundation, after losing her husband and brother-in-law to mesothelioma (a cancer caused by asbestos). This worthy cause is the only UK Charity working for everybody affected by lung disease. 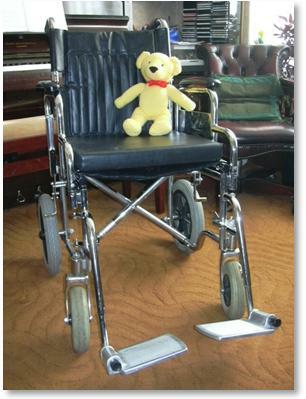 The charity is involved in victim care and support, and in research. 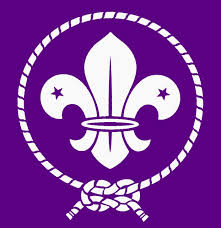 Smaller concerns are important to us: when the South Cave Scouts had their tents stolen, the Daggards contributed towards the purchase of new ones; we have aided in supplementing a local young dancer, and given money to Castle Hill Hospital’s Cardiac Support Unit, Hull Infirmary’s Heart Monitoring Unit, and to Age Concern's Exercise Pool Unit. Most of our donations over the past years have been to outside organisations, though our contribution to the Tsunami Appeal in 2005 was made through Grand Charity, and the £2000 towards Yorkshire Air Ambulance in 2008 was through the Provincial Grand Charity. The Daggards enjoy performing, but any contributions made towards our performances are gratefully received and are put to good use: we have purchased a defibrillator for the Lodge Building at Dagger Lane and when a second hand wheelchair became available, bought that too for those that might benefit by it being there (it is used quite frequently.) We have also directed our attention towards aiding the financing of the renovation of the ancient organ in the Lodge Room. We are very grateful to those Lodges (and to those individuals) who have helped us to help others.